Size: 231 sq.ft. - 580 sq.ft. Unimont Empire is a brand newlaunch project by Unimont Realty Group.Unimont is spread across 1.02acers of beautiful area. It offers excellent private views and is designed to offer optimum cross ventilation thus providing access to natural breeze and Sunlight. 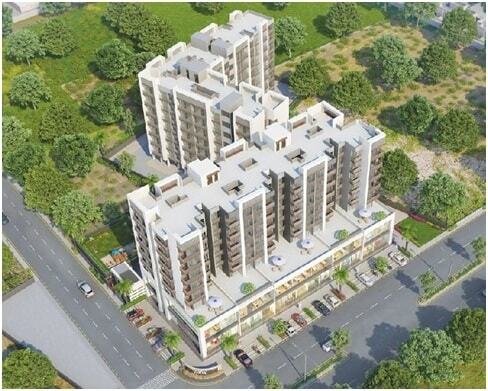 Unimont Empire is a project having 4 towers 1 RK, One BHK & Two BHK flats. There aparmnets are finely crafted with unmatched quality. The Empire flats are spacious, well ventilated and Vastu compliant. Unimont Empire has highest quality standards of construction in khopoli and surrounded by water and greens with refined lifestyle amidst the aura of a temple. The construction of Empire having 4 towers with 8 floors each& Studio apartment instead of 1RK.It has 1 RK with builtup area of 406 Sq Ft, 1 bhk- builtup area of 528 Sq Ft and 2 bhk- 1025 Sq Ftwith shops and work places within the project.The Rooms are commodious and wide that offers appropriate privacy to all residences. The location of Unimont Empire makes sure that the home-seekers are choosing the right apartments for themselves. Khopoli is one of the most prestigious address of Mumbai with many facilities and utilities nearby.Khopoli has affordable property rates as compared to Navi Mumbai and Mumbai Metropolitan Centre. It has become a hotspot for developers in the recent times as the City and Industrial Development Corporation (CIDCO) has taken over to develop the infrastructure of the region.Khopoli assures of an affordable housing and tranquil community and is emerging as a perfect destination for property buying and investing. The area provides an easy access to those who are working in the local chemical plants and big industrial companies of Pune. It also located close to the Mumbai-Pune Expressway, the locality has good connectivity to both Mumbai and Pune. Some of the popular holiday destinations including Lonavala, Raigad and Khandala are just a few minutes drive from the area. The complete address of Unimont Empire is Khopoli, Navi Mumbai, Maharashtra. Unimont Empire at Khopoli offers a pleasant living and good amenities like Art gallery for children, Gymansium, Swimming Pool, Intercom, Gated Community, Club House, Multi-Purpose Hall, Sports Facility, Yoga and Meditation room, Landscaped Gardens, Open Space, Trees, Jogging Track, Paved Compounds, Elder Sitouts, Club House, Kids Play Area, Sport Arena, Power Backup for Common Area and Elevators, Car Parking, 24 Hour Water Supply, Support Staff Quarters, Piped Gas Provision. Schools: - Buddhist International school, IVY English Medium School, Royal Pre-school, Carmel Convent School. Shopping Malls: - Samuels Mall, Central Plaza, Chandan Supermarket, Kripansh Clothing, Alaina city plaza. Movie Theaters: - Samuel Cinema, Gold Cinema, Khopoli, RishabhTiwari Movie Theatre. Pharmacies: -New Agrawal Medical, Shiv Parvati Chemist, AmitWadakar, Kokan Medical, Takey Medical Stores. Hospitals: -VidyaPrabha Hospital, Jakhotia Nursing Home, Kejriwal Hospital Khopoli, Dr.Gosavi Pediatric Hospital, JayrutukamalHopital And I.C.U, Kulkarni Nursing Home. Bus Stops: -Khopoli Bus Station, Jagdish Nagar stop, ShilPhata Bus Stop, State Transport Bus Halt. Restaurants: -Sagar Plaza Hotel, Deepak Hotel, Celebration Family Restaurant, McDonald's, Sai Ganesh Restaurant, Cafe Coffee Day. Bank/ATMs: - Axis Bank ATM, Bank of Baroda ATM, State Bank Of India ATM, Bank Of Maharashtra ATM, IDBI ATM, PNB ATM, HDFC Bank ATM.